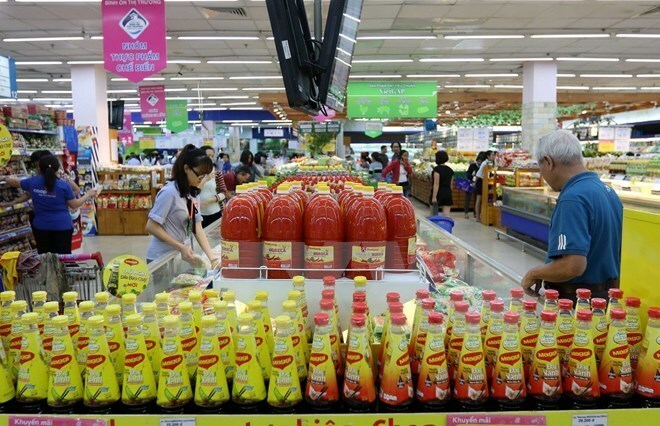 Hanoi (VNA) – Consumer price index (CPI) in May dropped by 0.53 percent from the previous month mostly due to a sharp fall in food prices, the General Statistics Office (GSO) said on May 29. This month’s CPI rose 0.37 percent from last December and 3.19 percent from the same period of 2016. The five-month figure hiked 4.47 percent from a year earlier. Seven of the 11 groups of main commodities and services saw slight price increases, namely culture, entertainment and tourism (up 0.13 percent); household appliances and goods (0.1 percent); beverage and cigarette (0.08 percent); garment, footwear and hat (0.05 percent); and medicine and health care services (0.04 percent); education (0.02 percent); and other goods and services (0.15 percent). Price declines were recorded in the four remaining groups. Food and catering services prices sank 1.43 percent, followed by transport services (down 0.34 percent), postal and telecommunication services (0.05 percent), and housing and construction materials (0.02 percent). Do Thi Ngoc, Deputy Director of the GSO’s Price Statistics Department, said in the group of food and catering services, grain food prices decreased 0.06 percent in May because northern provinces have been harvesting the winter-spring rice while rice export became stagnant. Prices of foodstuff, which makes up the biggest proportion in the food and catering services group, declined 2.27 percent, mainly in fresh meat. Notably, pork prices plummeted 9.94 percent from April due to a surge in supply, unchanged demand, and Chinese traders’ weak purchase. She added petrol prices were cut on May 5 and 20, leading to a 0.71-percent fall in fuel prices compared to the previous month. Meanwhile, there are factors hampering a further drop in CPI, including the hot weather, which fanned electricity consumption that in turn boosted power prices up by 0.98 percent. The hot weather also spurred the demand for cooling equipment and summer apparel and footwear. Housing maintenance materials grew 0.93 percent as construction sand prices soared after sand mining was restricted nationwide, she noted. In May, domestic gold prices fluctuated in line with global gold prices, dropping 0.1 percent from April to around 36 million VND (1,853 USD) per tael. The price of US dollar also declined slightly to 22,600 – 22,700 VND per USD. The GSO said the core inflation, which is the CPI excluding grain food, fresh foodstuff, energy and the State-managed goods of health care and educational services, in May increased 0.08 percent month on month and 1.33 percent year on year. The five-month core inflation rose by 1.56 percent from a year earlier, lower than the planned inflation of 1.6 – 1.8 percent, indicating a stable monetary policy. CPI in June is likely to be the same or fall slightly from May since pork and poultry prices will still follow the downward trend.